A significant amount of Mr. Buffett’s income came from sources that the government had already taxes at 35% (corporate taxes). There is no reason to tax that money again. Mr. Buffett’s secretary did not pay more in taxes than he did. That is a lie. After Hurricane Katrina devastated New Orleans, one of the problems with the families who returned to the city quickly was how to educate their children. Many of the families who returned after being evacuated came home to destroyed schools and a limited number of teachers. The city had no choice but to reform the school system. Post-Katrina New Orleans is already the nation’s leading charter-school zone, with 80% of city students enrolled, academic performance improving dramatically, and plans to go all-charter by 2013. To spread the model statewide, the Governor would create new regional boards for authorizing charters and offer fast-track authorization to high-performing operators such as KIPP. He’d also give charters the same access to public facilities as traditional public schools. Needless to say, the Louisiana Association of Educators is opposed to Governor Jindal’s plans to go all-charter by 2013. Governor Jindal has also stated that he would only grant tenure to teachers who are rated “highly effective” five years in a row–the top 10% of performers. Tenure would not be a lifetime thing–any tenured teacher who rates in the bottom 10% would return to probationary status. The “last in, first out” policy would also be banned. This sort of reform improves the schools, but I suspect the unions will be working hard against the Governor in his next campaign for governor. This is the kind of government reform we need in all states. It is unfortunate that it took a devastating hurricane to reform the system. I wish Governor Jindal total success in implementing his plans–they will make a big difference to the children of Louisiana. I did not grow up on a farm. I am not sure I have ever been on one (other than school trips and a friend who has a barn and various animals). However, I am aware that the food in the grocery store comes from farms–many of them family-owned. The attack on the family farm through the estate tax is obvious–many family farms are land-rich, but do not have the liquid assets to pay off estate taxes–many of those families have to sell the family farm to pay the estate taxes. Now there is a new attack on the family farm and the culture and work ethic it represents. Townhall.com reports that a new sweeping set of rules proposed by Hilda Solis, Secretary of Labor, will change the dynamic on the family farm. Prohibit children under 16 who are being paid from operating most power-driven equipment, including tractors and combines. Some student-learners would be exempted from the ban on operating tractors and other farm implements, but only if the equipment has rollover protection and seat belts. Bar those under 18 from working at grain elevators, silos, feedlots and livestock auctions and from transporting raw farm materials. Prevent youths 15 and younger from cultivating, curing and harvesting tobacco to prevent exposure to green tobacco sickness, which is caused by exposure to wet tobacco plants. Prohibit youths from using electronic devices such as cellphones while operating power-driven equipment. Solis believes that some farm work is “too hazardous for children to be engaged in.” How she knows this is anyone’s guess since she apparently has never lived or worked on a farm, nor do we find any evidence that she has children of her own. My experience is that the children who grow up on farms learn a lot of things other than how to drive a tractor. They learn to contribute to a family business. They learn the value and satisfaction of a job well done. They learn a work ethic. Many of the jobs this law would prohibit those under 18 from doing are the jobs those children do to earn money to go to college. Parents are the best judge of what equipment their children are able to operate–not the government. I think most of us would agree that the U. S. Tax Code has gotten a little bit out of hand. In 2005, the Tax Code was more than 9,097,000 words (according to a website called freedomworks the Bible contains 774,746 words). How did we get here? The Tax Code is a tribute to the power of lobbying. Some of the intricacies have valid purposes–the mortgage interest deduction encourages home ownership, a stabilizing force in our society). Some of the intricacies have negative impacts on the values of our society–the marriage penalty for example. The Tax Code is a monstrosity that requires a professional to sort through for many Americans. Our current Tax Code written down weighs more than most toddlers! Yesterday Big Government posted an article about an academic study showing that as tax rates were raised, tax evasion increases. They spent money to figure that out? Please follow the link to read the entire article. This is an obvious truth, but changing the Tax Code in America would result in something of a loss of power to those in Congress. Somehow, I don’t think that will happen until we change Congress, and even then I am not sure we have the leadership to do what is right. Frank Gaffney,Jr., at the Center for Security Policy posted an article today about General Boykin cancelling his speech at a West Point Military Academy prayer breakfast due to pressure from the Council on American-Islamic Relations (CAIR) and leftwing political groups. This proposition is bizarre on multiple levels. For one, General Boykin, who is a friend and greatly admired colleague of mine, is one of the United States’ most accomplished and decorated military heroes. He served in and led our most elite special forces units for decades, including in many of our most dangerous recent combat operations. He also held a number of senior positions in the intelligence community, including as the Deputy Under Secretary of Defense for Intelligence. For another, Jerry Boykin is also an ordained minister. And the sorts of events CAIR has lately insisted he must not address include prayer sessions convened by the mayor of Ocean City, Maryland and the U.S. Military Academy at West Point. Because he has been honest about the threat of radical Islam to America, CAIR is labeling him Islamophobic and blocking his right to speak. For example, another colleague, former Congressman Fred Grandy, was removed from his position as one of Washington’s most popular talk radio show hosts when he refused to allow Muslim critics to dictate who could appear on his program and what they could say. Last fall, Stephen Coughlin – one of the nation’s foremost non-Muslim experts on shariah – was similarly subjected to a CAIR-led effort to deny his ability to speak. In that case, he was denied by the Obama administration the opportunity to provide training to Central Intelligence Agency personnel about what impels our enemies to engage in murderous and stealthy forms of jihad, namely shariah. More recently, New York Police Commissioner Ray Kelly has been subjected to a campaign of vilification by CAIR and its friends. His offense? Mr. Kelly gave an interview to the makers of a superb documentary, “The Third Jihad,” and allowed that film to be used in training his officers. I have seen the movie “The Third Jihad.” It is narrated by Zuhdi Jasser, a Muslim who wants to see Islam actually become a religion of peace. It is a very informative movie that reminds us what the potential impact of radical Islam will be on America. To paraphrase the famous German pastor, Martin Niemöller, first they are coming for the “Islamophobes” and for Muslims who oppose shariah’s political agenda. How soon will they decide that you have no right to speak freely, either? Today’s Detroit News reported today that the government has revised the estimated losses from the auto bailout up $170 million. In the government’s latest report to Congress this month, the Treasury upped its estimate to $23.77 billion, up from $23.6 billion. Last fall, the government dramatically boosted its forecast of losses on the rescues of General Motors Co., Chrysler Group LLC and their finance units from $14 billion to $23.6 billion. Much of the increase in losses is due to the sharp decline of GM’s stock price over the last six months. Three solar companies the government invested in went bankrupt or laid off workers last week. The losses in the bailout of the auto companies were considerably more than what was initially projected. Have we learned yet that the government should not be investing taxpayer money in private businesses? Government interference in the free market has done nothing but take large amounts of money out of taxpapayers’ pockets and increase the national debt. Someone is needed in Washington who can put a stop to the overspending and misuse of taxpayers’ money. On Sunday the Business Insider posted a copy that was read Sunday in almost every Catholic Church in America. And therefore, I would ask of you two things. First, as a community of faith we must commit ourselves to prayer and fasting that wisdom and justice may prevail, and religious liberty may be restored. Without God, we can do nothing; with God, nothing is impossible. Second, I would also recommend visiting www.usccb.org/conscience,to learn more about this severe assault on religious liberty, and how to contact Congress in support of legislation that would reverse the Obama Administration’s decision. If you are not a member of the Catholic Church you may be wondering how this matters to you. It does! First of all, this provision to require the Catholic Church to provide medical care that violates its conscience is not the result of an actual law that was passed through Congress–this was enacted by the Department of Health of Human Services–unelected people not accountable to the voters. That alone is unconstitutional. Secondly, the law violates the right of the Catholic Church to freely practice their faith. The Catholic Church provides adoption services (now eliminated in some states due to being forced to allow homosexual couples to adopt children–against the Catholic faith), hospitals and many other charities. All the employees of those organizations will be included in this law. The attack on the Catholic Church by the Obama Administration will spread to people of other faiths who believe in the Bible. If you are one of those people, it’s time to pay attention–your right to practice your religion is about to be violated. A website called GlobalWarming.org reported on Friday that the Las Vegas Sun reports that Amonix, Inc., a manufacturer of solar panels that received $5.9 million from the Porkulus, will cut two-thirds of its workforce, about 200 employees, only seven months after opening a factory in Nevada. Earlier last week, Ener1, a manufacturer of batteries for electric vehicles and recipient of Stimulus largesse, filed for bankruptcy. Evergreen Energy , also a recipient of stimulus money, has also declared bankruptcy. These companies are not even viable when the government is writing them enormous checks! When you consider the amount of stimulus money spent on pet projects of President Obama, it is scary. He could have simply given each taxpayer $100,000. I suspect that would have truly stimulated the economy! The interesting part of the article linked above is the comments. There are definitely some people out there who are paying attention and who are angry that taxpayer money is being spent in this way. The Republican primary race seems to have come down to a contest between Mitt Romney and Newt Gingrich. I am totally willing to admit, political junkie that I am, that I haven’t made up my mind yet. I am willing to admit that I think that both leading candidates have totally forgotten President Reagan’s Eleventh Commandment. There are a few things I am watching in deciding who will get my support–who is supporting each candidate and who is opposing each candidate. It was obvious at the start of the campaign that the Obama campaign was preparing for Mitt Romney as their opponent. Romney was ‘the next in line’ which, unfortunately, seems to be the way the Republicans choose their candidates. It doesn’t work very well, but they keep doing it. The Occupy Wall Street movement was the perfect prelude to a campaign against Mitt Romney–the man is obviously wealthy–he has worked hard and accomplished many things to obtain that wealth, but an opposing campaign could overlook that and just characterize him as the ‘evil rich.’ Governor Romney seems to be the choice of the Republican ‘establishment.’ Newt Gingrich is the rebel candidate. He has been knocked down twice already and just seems to bounce back up. He seems to be the Tea Party candidate (although I seriously doubt he was their first choice). Newt is a bit of a loose cannon, but seems to have an ability to explain things so that ordinary people can understand them and to get things done (although he steps on peoples’ feet in the process). As I have posted earlier, the ethics charges against him in the mid 1990’s were later proven to be completely false by the IRS. I believe he was run out of the House of Representatives on a rail (so to speak) because he was a threat to both the Republican and Democrat Washington establishment. If he can make that case to the public, he will win the nomination and the election. 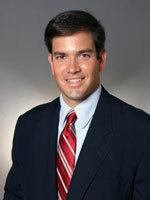 On Friday, January 27, Newsmax.com posted a short article discussing some of the attacks on Newt Gingrich. Ronald Reagan’s eldest son Mike Reagan has issued a statement regarding the claim that Newt Gingrich did not support Ronald Reagan. “I am deeply disturbed that supporters of Mitt Romney are claiming that Newt Gingrich is not a true Reaganite and are even claiming that Newt was a strong critic of my father. “Recently I endorsed Newt Gingrich for president because I believe that Newt is the only Republican candidate who has both consistently backed the conservative policies that my father championed and the only Republican that will continue to implement his vision. “It surprises me that Mitt Romney and his supporters would raise this issue — when Mitt by his own admission said he opposed my father in the 1980s claiming he was an ‘independent,’ and later supported liberal Democrat Paul Tsongas for president. “As governor of Massachusetts, Romney’s achievement was the most socialistic healthcare plan in the nation up until that time. “Say what you want about Newt Gingrich but when he was Speaker of the House he surrounded himself with Reagan conservatives and implemented a Ronald Reagan program of low taxes and restrained federal spending. Beware of the spin! Listen to the people who are closest to the events and have nothing to gain or lose by telling the truth. Before I post this article, I would like to say that I think the whole thing is moot. The only reason I am posting it is that no one in the news is talking about it. Is that because it is silly or is there something there? I have no idea, but here is the information. On Thursday, a website called The National Patriot posted the testimony from a trial going on in Georgia to settle the question of whether President Obama is eligible to be on the Georgia presidential ballot. Yes, you read that right. …Immigration Services documents entered into evidence regarding Obama Sr.
…Enters into evidence a portion of letter received from attorney showing a renewal form from Obama’s mother for her passport listing Obama’s last name something other than Obama. She was hired to look into Obama’s background and found a Social Security number for him from 1977. Professional opinion given that this number was fraudulent. The number used or attached to Obama in 1977, shows that the true owner of the number was born in the 1890. This shows that the number was originally assigned to someone else who was indeed born in 1890 and should never have been used by Obama. …Expert in document imaging and scanners for 18 years. Mr. Vogt testifies that the birth certificate, posted online by Obama, is suspicious. States white lines around all the type face is caused by “unsharp mask” in Photoshop. Testifies that any document showing this, is considered to be a fraud. Mr. Vogt testifies that a straight scan of an original document would not show such layering. Ran Obama’s SS number through database and found that the number was issued to Obama in 1977 in the state of Connecticut . Obama never resided in that state. At the time of issue, Obama was living in Hawaii. Please follow the link to the article to read the entire testimony and draw your own conclusions. I have no idea what to think. 1 Number of unemployed in January 2009 and December 2011. http://www.bls.gov/data/#unemployment. 2 “Long-term unemployed” means for over 26 weeks; data for January 2009 and December 2011. http://www.bls.gov/data/#unemployment. 3 Unemployment rates in January 2009 and December 2011. http://www.bls.gov/data/#unemployment. 4 “High unemployment” means having a 3-month average unemployment rate of 6% or higher. From the Bureau of Labor Statistics’ “Extended Benefits Trigger Notice” for January 18, 2009 and January 22, 2012. http://www.ows.doleta.gov/unemploy/trigger/2009/trig_011809.html and http://ows.doleta.gov/unemploy/euc_trigger/2012/euc_012212.html. 5 The “Misery Index” equals unemployment plus inflation. For January 2009 and December 2012. http://www.miseryindex.us/indexbymonth.asp. 6 Average retail price per gallon, January 2009 week 3 and January 2012 week 4. http://www.eia.gov/dnav/pet/hist/LeafHandler.ashx?n=PET&s=EMM_EPMR_PTE_NUS_DPG&f=W. 7 U.S. Department of Agriculture, values represent monthly “moderate” cost per family of four for January 2009 and November 2011. http://www.cnpp.usda.gov/USDAFoodCost-Home.htm. 8 U.S. median sales price of existing single-family homes for metropolitan areas for 2008 and 2011 Q3. http://www.realtor.org/research/research/metroprice. 9 Residential mortgage delinquencies (real estate loans) for 2008 Q4 and 2011 Q3. http://www.federalreserve.gov/releases/chargeoff/default.htm. 10 Values for January 21, 2009 and January 23, 2012. http://www.treasurydirect.gov/NP/BPDLogin?application=np. This is where the focus of the debates should be. Hot Air posted an article today about the status of the oil exploration that the Obama Administration loaned Brazil’s oil company Petrobras $2 billion to support. At the same time the President was giving the $2 billion for Brazilian oil exploration, he was drastically slowing down leasing and permitting in the US and whining about “subsides” to US oil corporations. It was okay to subsidize Brazilian companies doing oil exploration, but for some reason it was not okay to subsidize American oil companies. This is not good news. When America has a weak President, bad things happen. One of the highlights of the President’s State of the Union speech was his stating a plan to open 38 million acres for oil exploration in the Gulf of Mexico and a contest for natural gas technology. Erik Milito, upstream director for the American Petroleum Institute (API), was not particularly impressed by the plan. Milito noted the lease sale outlined by the Obama administration was originally included in a program that became effective in 2007. Obama’s critics said the White House was in essence trying to generate political capital based on decisions made by the previous administration. The API said Obama’s lease announcements left more than 85 percent of offshore areas off limits to energy explorers. This is another reason voters have to pay close attention to anything said by any politician running for office this year. There will be a lot of misinformation floating out over the airwaves and in print in your local and national newspapers. It’s up to us to be our own fact-checkers! Admittedly the role models were questionable at best, but Welcome Back Kotter was one of my children’s favorite shows when they were growing up. It was a fun show and the actors on it were extremely talented and always seemed to enjoy what they were doing. NJ.com reported today that Robert Hegyes, who played Juan Epstein on the show, died this morning in Metuchen,, New Jersey. He was 60. He graduated from Rowan University (then Glassboro State College) with a bachelor’s degree in speech/theater and secondary education — Rowan spokesman Joe Cardona called him a “great friend” of the school, noting that he sported a Rowan shirt while co-starring as Det. Esposito on “Cagney and Lacey” — and quickly found work in New York, co-starring Off-Broadway in “Naomi Court” and in the Broadway drama “Don’t Call Back.” He was then cast as Epstein, a role he played for “Kotter”‘s four-season run on ABC. Mr. Hegyes was part of a cast of characters that gave us a lot of laughs during the four-season run of Welcome Back Kotter. He represents a type of free-flowing comedy that we don’t seem to have on television at the present time. He will be missed. We all heard about the excessive tax burden of Warren Buffett’s Secretary (who makes more than $200,000 per year), but my sympathy for this lady is running a little thin. I am glad she makes what she makes, but the fact that she is overtaxed has nothing to do with what Mr. Buffett pays in taxes–it has to do with the fact that the government is overspent. Yesterday The Smoking Gun pointed out that this poor overtaxed lady just bought a second home in Arizona, complete with a swimming pool and a “professional PGA putting green,” according to real estate records. The principal Bosanek residence is in Bellevue, Nebraska, several miles from Buffett’s corporate headquarters in Omaha. The couple’s 2568-square-foot home, built in 2000, also has four bedrooms and two-and-a-half baths. But the modest property, which Sarpy County assessors last year valued at $217,716, offers no outdoor amenities for swimmers or golfers. All of us are overtaxed. Mr. Buffett is not undertaxed. The government is overspent. I haven’t written anything about the State of the Union speech because I thought it was a political exercise. This is the ‘silly season’ and truth is a rare commodity in political speeches right now (not that it is always there in other times). However, the Wall Street Journal posted an editorial today that makes some very good points. 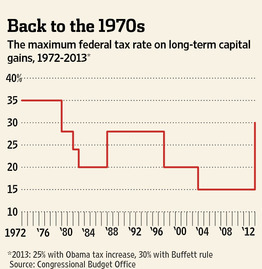 As you can see, the federal tax rate on long-term capital gains has varied a lot over the years. The article points out the fallacy of the “Buffett Rule” that President Obama is proposing which would make wealthy Americans give more of their money to the government. The Congressional Budget Office reports that the effective income tax rate of the richest 1% is actually about 29.5%. That is the rate you come up with when you include all federal taxes–such as the distribution of corporate taxes. That is about twice the 15.1% rate paid by middle-class families. Investment income has already been taxed once. There is no reason to tax it again unless you are trying to redistribute wealth. As the nearby chart shows, the rate has never since risen above 28%, and the last time it moved that high was in 1986 as part of the Reagan-Rostenkowski tax reform that also cut the top marginal income tax rate to 28% from 50%. With income-tax rates so low, a differential was arguably less necessary—though it’s worth noting that capital gains revenues fell dramatically after that rate increase. 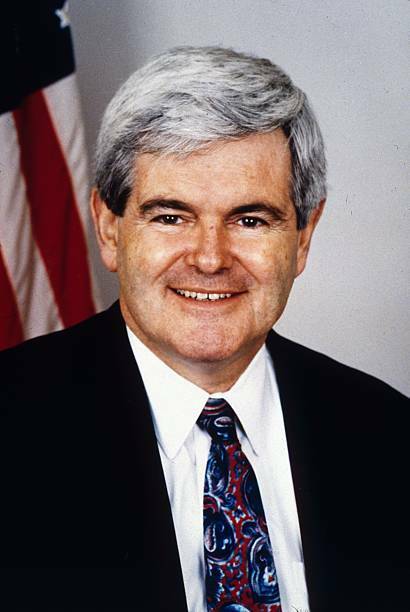 A decade later Bill Clinton agreed to cut the rate back to 20% as part of the balanced-budget deal with Newt Gingrich. Capital gains revenues soared, helping to balance the federal budget. Nearly every study estimates that the revenue-maximizing tax rate from the capital gains tax is between 15% and 28%. Doug Holtz-Eakin, the former director of the Congressional Budget Office, says that a 30% tax rate “is almost surely above the rate that maximizes tax revenues.” So it’s likely the Buffett trick would lose revenue for the government. So if we are in a time of federal deficits, why would you change the tax code in a way that would lose revenue for the government? Unless you are using the tax code to redistribute wealth, it makes no sense. Michael Yon is one of my favorite reporters. His website is MichaelYon-online. I first traveled to Iraq in December 2004, but the prime impetus to go occurred almost nine months earlier, after two friends were killed in two days in Iraq–one in Falluja, the other in Samara. In April, 2004, I attended both their funerals, also days apart, one in Colorado, the other in Florida. I met many veterans of the war on terror, some of whom encouraged me to go to Iraq or Afghanistan, and write the truth. One childhood friend in particular—Rodney Morris—regularly called and emailed me, asking me to come over to Iraq, where he was then known as Lieutenant Colonel Morris. My initial reaction was, “Are you crazy!? I am a writer, not a war correspondent.” I thought there was nothing I could offer, and being intimately familiar with the effects of bombs and bullets, and having no wish to be burned alive or shot down, I repeatedly declined. But those two funerals, coming so close upon each other, got me thinking. In a decision that entailed shelving serious investments in labor and time, I put current projects on hold and packed off for Iraq. When 2004 turned into 2005, I was in Baquba, near Baghdad. At that time, heading into Iraq’s historical first elections, there was daily fighting in Baquba. It was definitely newsworthy, but I was not sponsored by or affiliated with any media organizations. In fact, I had barely heard of the word “Blog,” when about three weeks into January 2005, I blogged my own first dispatch from Baquba. A young Iranian woman has written to me off and on for a couple of years. Yesterday she sent a note. What do young Iranians think about our government and about the Iranian government? Also, do you think there will be war? “To make the long story short people in Iran, not just youth, hate the government and want to move out of the country as soon as they can. My sister [deleted] is moving to [deleted] with her husband this July and then when my mother gets retired, me, my younger sister [deleted] and my parents will sell our house and move to live with them. My father isn’t convinced yet but all he needs is time, I’m sure he will choose to come with us. “I am a patriot and I will remain one no matter where I am, but lets face it. Things are bad and getting worse as every day goes by. I have plans for my future and do not want to stay in a country where my skills and capabilities are most likely going to waste. We need to remember that although Iran is currently ruled by evil people, the people of the country are not all evil. My heart goes out to this lady and my sympathy goes out to her for what she has been through. The best answer for Iran would be for the people of overthrow the current government, but I suspect the government has done away with anyone with the potential to lead such a revolution. The country is not evil–the government of the country is. As I have stated, I am not supporting any particular Republican candidate right now. I am, however, concerned about the circular firing squad the Republican candidates seem to be forming. The debates seem to be saving the Democrats a lot of time and effort when it comes to future opposition research. On February 9, 1999, Brent Bozell posted a column at Creators Syndicate about the charges against Newt Gingrich. No wonder no one knows that he was cleared of the charges. It seems to me that if the truth ever comes out, those who are still claiming that Newt is guilty of something will look worse than Newt! The column goes on to detail some of the press coverage of the events and contrasts them with other situations involving Democrats. The bias is obvious. We need to understand that the press is no longer maintaining any semblance of impartial reporting. When the facts get in the way, they simply fail to report them. The Daytona Beach News-Journal posted a story today about a 64-year-old grandmother who stopped a car thief in his tracks. Karen Granville stated that she was up late because her cat woke her up. She was watching the Bravo channel when she heard a police helicopter hovering over her house. She saw the suspect, Roderick Willis, run into her backyard and attempt to climb over her fence. The quick-thinking lady grabbed her .38 Special revolver and followed him. Granville held the man at gunpoint until police arrived. This is my kind of grandmother! This is the second time in less than two weeks older city residents have armed themselves to stop would-be criminals. Charles Robbins, 82, shot and killed 24-year-old Tyler Orshoski after the man apparently tried to break into his home Jan. 11. Police Chief Mike Chitwood said he doesn’t encourage vigilante justice but said people have the right to protect themselves or their property. Willis was charged with fleeing and eluding law enforcement, driving with a suspended license, use of a vehicle to commit a felony, possession of marijuana, possession of cocaine with the intent to distribute. He was booked into the Volusia County Branch Jail on Tuesday and released after posting $7,500 bail. Willis, who could not reached by phone Tuesday night, spent time in jail last year for fleeing officers, court records show. Volusia County sheriff’s officials say the Dodge Charger belonged to Hertz Rental Car Co. and was turned over to the company. Willis was not charged with vehicle theft. One does wonder why he was not charged with vehicle theft and why the bail was so low. No wonder the citizens are arming themselves.